I haven't owned a bike in over a decade, and decided I wanted to get a foldable mountain bike to ride around the neighborhood to build back some physical conditioning/endurance and eventually go for a ride with the g/f (park) in the future. My budget is/was sub $200. So I started on craigslist and ended up on ebay. So impulsively, I went and bought an "unbranded" bike off ebay for $185 (after $14 discount) shipped. It should be here tomorrow i think. I didn't even really pay attention to the specs outside of the basics. I know.. i know. 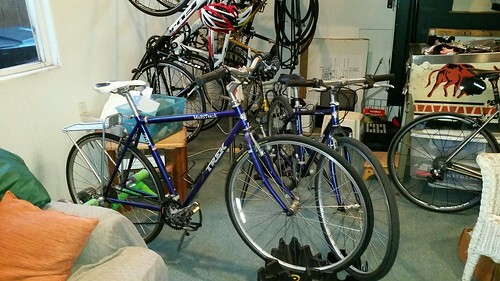 Ok until I can post links, you can see what i bought by searching ebay for "26 inch mountain bike,21 speed,26 inch Foldable Unisex Bicycle, road bike" and you should see a bunch of the same listing. A friend of mine (rides bikes all the time) had a field day laughing at the listing details (and engrish). I started reading some of the forum stickies here and it looks like i probably made a terrible mistake, but I just wanted to get some forum input on what's the more savvy course to take from this point on. Should I be planning to return it immediately and start over with a little more brand research? Should I just stick with it and see if it's even halfway decent? Or should I be looking to see if it accepts industry standard aftermarket parts and plan to upgrade it with stuff from more well-known/reputable sources? All feedback/criticism welcome. It's terrible as a real bicycle, but you might as well putt around on it for a few months, then give it to someone who scrounges recycling and buy something better. Steel frame and steel wheels. Probably steel everything, Well, it will be heavier than most bikes, but people ride single speed cruisers that are heavier. And I myself once bought a $99 fatbike from Walmart.com. 100% steel except for the rubber parts. I replaced everything except the BB axle and frame. No, you do not want to do that with your new bike. You could buy a better one with the money spent on parts. Instead, work out on it, get back in condition, and your next one will sbe like running around in tennis shoes after clomping around in ski boots all day. And who knows. I fished all all-steel Schwinn mountain bike (alloy rims) with front suspension out of the trash last Fall. I've ridden it briefly after patching the tires and it seems to be OK.
Edit: You could also send it back, but I bet the shipping would be horrendous. Not fair to the seller either. Last edited by Doc_Wui; 04-05-18 at 11:42 PM. Despite being called one and looking like one it is not a mountain bike. It is mountain bike style and would be unsuitable for off road despite its disc brakes. Low end suspension and freewheels are just not strong. Looking at those shifters they appear they may be non-indexed and who can mountain bike with friction gear shifters? I didn't even know they still did non-indexed gearing for the rear derailleur but going to the Saiguan site its clear some models are friction and not indexed but others may simply be indexed without numbers marked on top, my guess would be friction though due to the model numbering and I can only see one lever with no button to lower the gear. The derailleur is generic too. Bike claims a load capacity of 160kg which is the pretty much what modern bicycle certification has as the recommended limit including the weight of the bike but then its a steel frame and 26" wheels which are generally quite strong even cheap ones. My analysis would be a bike designed to look as stylish as possible using the cheapest possible parts. On first glance it looks good but in the detail quite poor. Doesn't mean it can't be an enjoyable bike and fit for general riding etc but off road it could only do very light trails as soon as you hits the bumps etc you could damage the suspension if its low end quality. Also you may want to change the saddle if its very basic and uncomfortable. This is pretty normal for any bike to get a good fit anyway. 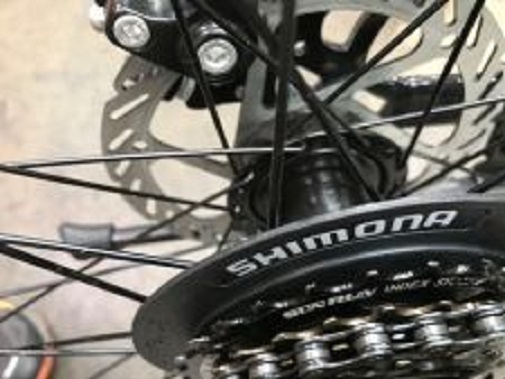 For a low end drivetrain I like to simplify it, I would probably remove the front triple chainset and replace with a single chainset also removing the front derailleur and shifter so the only have 7 gears. Yes it makes hills tougher but then you have shifting that is simply 1-7 and easy and fast to operate. This depends on your fitness but in its current state shifting is going to be slow and fiddly trying to find the best position by instinct for both the front and rear derailleurs. If you manage to bend the rear axle of the rear wheel then consider upgrading to a hardened chromoly axle for additional strength. It's a cheap but very worthwhile upgrade. It's not worth putting serious investment in this bike. Small improvements only. The frame and forks are just not worth it. Both parts have a finite working life due to the suspension. Maybe $30-40 max spend. However anything you can move to another bike shouldn't be factored in, saddle, lights etc. Expect the worst and then you might be pleasantly surprised. Couldn't find your bike but, having picked up and refurbished a bunch from the dump, I think you could make that a lot better by repacking and adjusting axle, headset and bottom brackets, finding some cheap 1 1/2 inch slicks, going to 1 chaining and losing the front derłaileur, and perhaps getting a 10 buck pair of "dutch" style ergo grips from Rivbikes. Performance bikes has the slicks, which I have bought for 12 each. You can also grease the brake and derailleur cables. All this for 40 or less and a little effort. You may later replace the saddle, get better rim tape and iner tubes as you like. Make sure it is properly and safely assembled, that's step one with an ebay bike. Then just ride it. You'll get in shape very quickly riding something like that. Once you have tested the waters, so to speak, in terms of your interest in cycling - but before the heavy bike puts you completely OFF biking - buy yourself a nicer bike after you do some research. You could keep this one as a beater bike if you ever ride places where security is an issue. Or turn it into a heavy cargo carrier. Get it assembled at a bike shop, do a few safety upgrades, ride it & enjoy it for awhile. Being a cheap ride doesn't mean you can't have some fun with it. It's an inexpensive beater bike, and you should be fine. When the time comes for you to upgrade to a newer bike, ask for some recommendations. People here will pepper you with a BARRAGE of suggestions. I can 100% guarantee no 1 will listen to your monetary requirements,...but you'll eventually find the correct answer. LOL!!! Last edited by tds101; 04-06-18 at 05:14 PM. You, sir, just NAILED IT!!! Hopefully as a folder, it doesn't need much assembly. Unfold, straighten the bars (very complex task requiring an aerospace engineering degree), then ride. Oh, it never hurts to double check the derailleur adjustment. Perhaps a LBS could help you with derailleur adjustment if you aren't ready to take the plunge. I never would return an E-Bay purchase because I decided that I want something different. Only if there is some issue that wasn't in the ad. You can always try it out then resell it on Craigslist if it doesn't work out. That does look like a moderately small frame. How tall are you? A "unisex adult"? Anyway, put it together, ride it, and decide if you like it. Hey no input on your dilemma, but from one pinball aficionado to another, you should have known better! My 1972 electric mechanical El Toro pinball machine is partially seen top right side of photo. If someone with the skills of a big box store mechanic put it together, I'd get it checked over before getting on it. I've seen reversed forks, and some other crazy stuff that can kill you. Definitely check the torque on critical bolts. Seems to be commonly sold under the land rover name (no connection with the car brand) but has also been sold under brands like BMW etc. Factory price looks like it could be as low as $30 according to this page. I would imagine its one of the lowest price models due to spoke wheels and friction shifters. I noticed even when it has a rear cogset of 8 or 9 gears it's still a freewheel not a cassette. 8 or 9 speed freewheels of this quality can be an absolute nightmare to get working consistently due to freewheel wobble. Lots of videos on youtube for the land rover mountain bike. Not seen any riding it off road but I've only had a fleeting look. You've got to love the blatant branding rip off's on these bikes. Also Kenida and Kendo tyres etc. I'm sure there are more to discover. ^^^^ Wow. That's really ballsy.